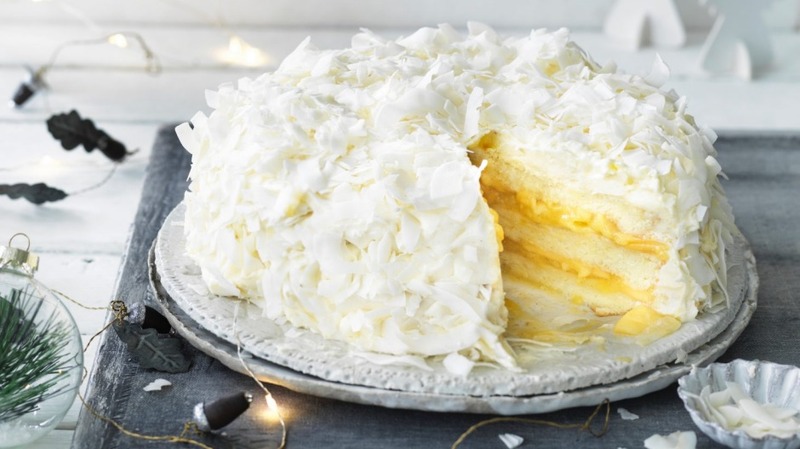 I love this cake for special occasions and especially Christmas in Australia, when mangoes are at their peak. It's delicious, can be made ahead and it's a showstopper. If you're making this for children or not drinking, leave the rum out of the sugar syrup. But if you enjoy a boozy cake, add it in – it will only enhance the Christmas cheer! *Omit the rum syrup or just the rum if making this cake for children. 1. Preheat oven to 170C (155C fan-forced). 2. Butter three 23-25cm sponge tins, line bottom and sides with baking paper and dust with flour. Alternatively, this cake can be baked in a deep cake pan and sliced into three layers. It will just take longer to bake. 3. Whisk together the oil, eggs and vanilla. Combine the flour, salt, baking powder and the first measure of sugar. 4. Slowly whisk the egg and oil mixture into the dry ingredients and follow with the water. 5. Whisk the egg whites in a clean bowl until light and frothy then slowly add the second measure of sugar. Continue to whisk until stiff but not dry. 6. Fold the egg whites into the batter, starting with ⅓ of the whites, then the rest. 7. Pour batter into prepared tins and bake until set, about 20-30 minutes – a fine skewer inserted in the cake comes out clean and the centre should feel springy to the touch. Allow to cool before inverting and removing from tin. 1. To make the mango puree, blend the peeled and diced mango in a food processor or blender. 2. Mix the water and the cornflour until smooth and combined. 3. Combine the mango puree, sugar, vanilla and salt in a small pot and bring to a simmer. Slowly stream in the cornflour/water mix and cook until it simmers again and thickens. Pour into a small bowl and cover with plastic while it cools so a skin doesn't form. Set aside. Note: The frosting is added in two layers. A thin layer is spread over the cake first as a "crumb layer" to catch all stray cake crumbs, followed by a finishing layer before serving. 1. Cream together the cream cheese and butter in a stand mixer fitted with a paddle attachment. Add in the icing sugar, extracts and salt and whip together until light and fluffy. Finally add the coconut cream and mix until just combined. Set aside until ready to use. 1. Boil together water and sugar until sugar is completely dissolved, about 3-5 minutes. Allow to cool and add the rum. This can be made days in advance and kept in the fridge. 1. Place the first layer of cake on a serving plate or platter with pieces of baking paper around the base. This will keep the platter clean but allow you to get frosting all the way to the base. Using a pastry brush, brush some of the sugar syrup on to the cake – how much you use depends on how you like your cakes. Spread half the mango pudding on top of this layer and spread it out all the way to the edges. Cover with a layer of sliced mango. 2. Add the next layer of cake on this and repeat the syrup, mango pudding and sliced mango layer. Finally, top with the third cake layer. Use 2/3 of the frosting to coat the cake as your "crumb layer". Don't worry about making a mess here. Refrigerate for at least one hour. 3. Once the crumb layer has set, remove the cake from the fridge and spread the remaining frosting on the outside. Gently sprinkle the coconut flakes all over the cake, holding some flakes in your cupped hand and gently pressing against the cake to get up the sides. It will make a mess but brush up the flakes that have fallen on the bench and use those too. You want to make sure every bit of exposed frosting is covered with coconut. 4. At this point you can refrigerate the cake overnight and all that's left to do is remove from the fridge about an hour before you want to serve. Present the cake then slice and serve.